Now that the Matt Duchene sweepstakes have started up after it was announced Saturday night that the Senators have decided to trade their star center after they have failed to negotiate an extension. While the report suggested that the Nashville Predators and Columbus Blue Jackets were the two teams that have been in on acquiring the 26-year-old, The Fourth Period’s David Pagnotta reports that the New York Islanders and general manager Lou Lamoriello are also very interested in bringing Duchene over to Long Island. While no one is ever sure what Lamoriello plans to do, he is also well known for making an impact at the trade deadline and even though the Islanders are in first place in the Metropolitan Division, the team is still looking for an identity and has plenty of cap room and prospects to work out a potential blockbuster package if Lamoriello wants to do it. The team is still looking for a replacement for the loss of star John Tavares, who left for Toronto during the offseason. Duchene might be a solid No. 2 center for New York and could be viewed as a long-term piece in New York. 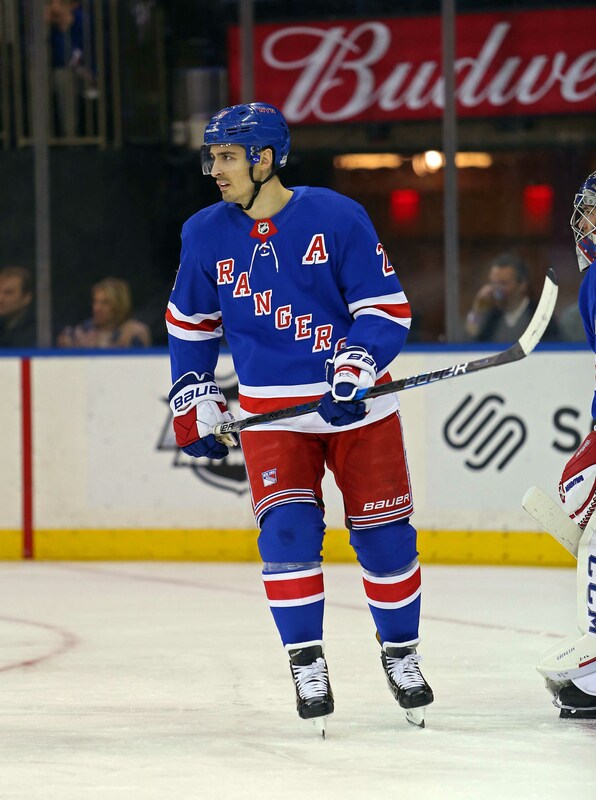 The New York Rangers got some good news after defenseman Neal Pionk sat out the third period of Sunday’s game after taking a stick to the eye from Pittsburgh’s Sidney Crosby, which many felt was a sign that the injury was severe. However, Rangers’ head coach David Quinn said that Pionk was held out for precautionary reasons and is expected to play Tuesday against Carolina. Despite being acquired by the Philadelphia Flyers on Saturday morning, the Philadelphia Flyers won’t have goaltender Cam Talbot available for their Sunday game against Detroit. The Athletic’s Charlie O’Connor (subscription required) writes that while no reason was given, it’s likely because Talbot is moving from Canada to the U.S. and with his primary employment being moved between countries, he likely will be dealing with visa issues for a little while. Sam Carchidi of Philly.com writes that the earliest Talbot could be ready will be Thursday, but the team could get back Brian Elliott even sooner. Depending on how he feels after his game Sunday, Elliott could be available to join Philadelphia on Tuesday and serve as a backup. Elliott has been out of the lineup since Nov. 15 with a lower-body injury. However, with Mike McKenna on the roster and Talbot soon to follow, the team will have four goaltenders and will be forced to make a move, most likely waiving McKenna. Friday: All three players have cleared, and can now be assigned to their respective AHL affiliates. Thursday: The New York Rangers are not having the season they expected. Today, according to Larry Brooks of the New York Post, they have placed Brendan Smith on waivers less than a year after re-signing the defenseman to a four-year $17.4MM contract. He’s joined by Marcus Kruger and Josh Jooris of the Carolina Hurricanes according to Pierre LeBrun of The Athletic. The Rangers recalled Neal Pionk earlier in the day and needed to make a corresponding move, but many expected it to be Marc Staal headed for injured reserve with his continued neck troubles. Instead, the team has decided to make Smith available to the rest of the league in an attempt to rid themselves of his contract. New York have allowed 35 goals in their last eight games and seen Henrik Lundqvist chased from the net three times, seemingly unable to complete simple defensive rotations at times. While Smith is still a capable NHL player, his extension is quickly looking like a mistake. Kruger and Jooris are the first victims of a Carolina team that has said recently that they can’t keep running the same group out every night. Head coach Bill Peters and GM Ron Francis believe this team is good enough to compete right now, but still find themselves struggling near the bottom of the Metropolitan Division. Kruger, acquired in the offseason from the Vegas Golden Knights after he was part of the Chicago Blackhawks’ expansion package, comes with a $3.1MM cap hit for this year and next. Jooris is scheduled to be an unrestricted free agent again this summer. The Rangers and Hurricanes will both save the prorated version of $1.025MM in cap space by sending Smith and Kruger to the minors (along with the entirety of Jorris’ $775K hit) if they should clear, but this seems more about giving other players a chance. Both teams are fed up with how their seasons have gone, and are starting to bring in new blood to try and turn things around down the stretch. While the Rangers prepare to sell at the deadline, Carolina still seems undecided over which path they will follow. The New York Rangers haven’t encountered this type of season often before, if ever. The team seems to be a bubble team with no true chance of making a deep playoff run or even winning a Stanley Cup. Yet, the team also finds itself with a handful of expiring contracts who could be utilized as key trade chips to refuel their retooling process. New York Post’s Larry Brooks writes the Rangers need to think about dealing players like Rick Nash, Michael Grabner and Nick Holden and get what they can for them. The scribe believes that general manager Jeff Gorton will have one of the biggest challenges in front of him in a long time as he will have to make a decision on which direction the team should go. Could Nash bring back a first-rounder in next year’s draft and if they can, would it be worth his value anyway? What can they get for Grabner? Should the team go full in and start shopping captain Ryan McDonagh now? The latter claim, Brooks writes, might make the most sense. The Rangers should be able to bring in a huge haul for McDonagh, who is still in his prime, is locked up until 2019 and is one of the top defensemen in the league. As there are quite a few playoff teams in need of defense, like the Toronto Maple Leafs, Edmonton Oilers and the Tampa Bay Lightning, the Rangers could truly change the way the franchise is heading at the trade deadline. New York wouldn’t be better off without McDonagh, but with long-term deals already having been handed out to Kevin Shattenkirk, Marc Staal and Brendan Smith and the young talent the team has on defense in Brady Skjei, Neal Pionk and Anthony DeAngelo, the team should be able to survive without him if they can get a talented scorer in his place. Hidden among yesterday’s stories was TSN’s Bob McKenzie refuting rumors that the Arizona Coyotes are thinking about dealing defenseman Oliver Ekman-Larsson to the Toronto Maple Leafs for William Nylander. McKenzie writes that as of Sunday, there had not been one conversation between the two teams about Ekman-Larsson. He also points out that since most teams do not view Nylander as a center, he wouldn’t bring enough of a return for Ekman-Larsson as just a sniper. However, from what McKenzie can see, the Coyotes are not willing to discuss moving Ekman-Larsson as of now. The Atheltic’s Sean Tierney tweeted today that with general manager John Chayka in charge, it’s hard to see the team trading Ekman-Larsson at all. John Vogl of The Buffalo News writes that frustration is hitting in Buffalo as the 5-12-1 Sabres continue to struggle, yet one player is thriving in Evander Kane. Dating back to last year, the 26-year-old wing has scored 40 goals in his last 79 games. He also has 11 points in the last 11 games. Kane added his 12th goal of the season Monday in the team’s 3-2 loss to Columbus. The secret to his success? Shooting the puck. He leads the team with 96 shots on goal this year.